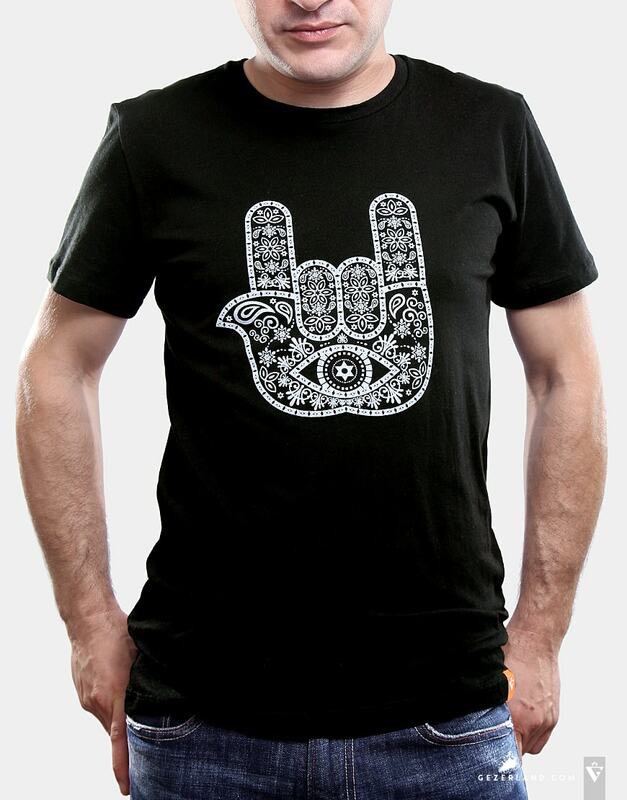 Hamsa Rock & Love - T-shirt 100% Cotton. Made in Israel. The Hamsa is a popular Jewish symbol, which depicts five fingers and serves as the embodiment of the God’s Hand. The word derived from the Hebrew word meaning ‘five’. Usually this sign is used for protection against negative spiritual forces such as jealousy, which is known as the ayin eye. It appeared in Kabbalistic manuscripts and served as a talisman since each finger symbolized one of five books of Moses. Some Jews also believe that the Hamsa embodies the Hand of Miriam, the sister of Moses and Aaron. By showing the picture of the opened right hand, the symbol of the Hamsa also signifies such characteristics as strength, success, and blessings. Being a beautiful and special symbol at first glance, it has a deep meaning. According to some evidence, one of the sources, from which the Hamsa could derive, is the event described in the Bible: the Jewish people gained the victory in a battle after Moses had raised his hands. Some people believe that it was the beginning of tradition to raise five fingers struggling against the evil. This unique custom is still alive in Jewish communities in the Middle East. 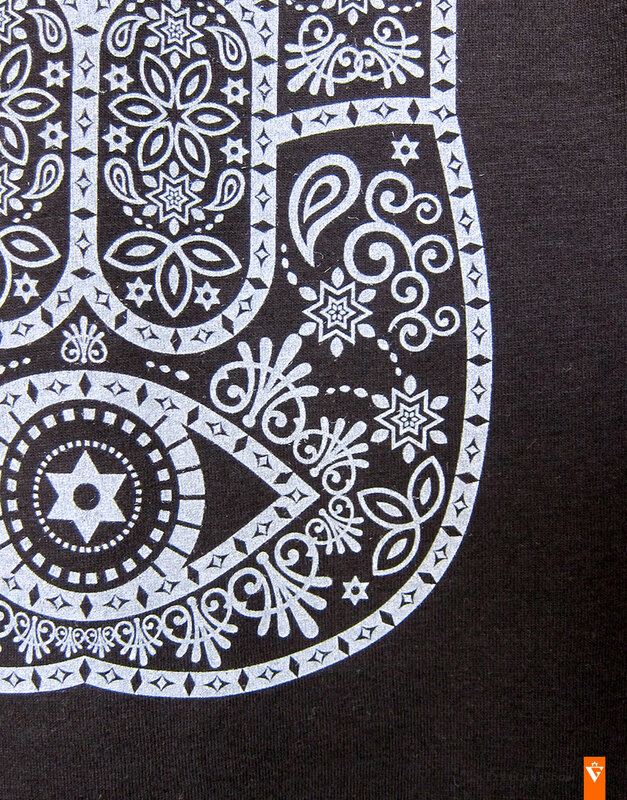 In addition to magnificent design at the front, the Hamsa is usually inscribed with prayers at the back. They can be of different types as there is no established liturgy. So, they may contain blessings for unity, peace, success, and pacification. The main point of the Hamsa is to arouse devotion and holiness in people’s hearts. As the Hamsa gives harmony, tranquility and other benefactors being so significant for Jewish people, many of them would like to have this symbol on their clothes and accessories so that it could protect them, wherever they go. It is a powerful sign which won’t leave anyone alone, without the God. That is one of the reasons why I have decided to depict this symbol on my T-shirts – I wish that everyone could take this symbol with him or her. As you can see, my symbol is a modernized image since I have designed its modern interpretation. This absolutely new and unique picture is the symbol of ‘love’ for deaf-and-numb people and at the same time the unity symbol for those who enjoy listening to rock music. Take the Hamsa with you!